Women on a Mission: Mom Edition: DOUBLEHEADER FRIDAY: DECK MY DECK! Well Friends, it’s one of my favorite times of the year – spring planting! Since I live in a condo, I’m a little restricted in my options – only a handful of pots fit on our deck. I make use of the space I’ve got! And thankfully, Thrifty Nana lets me spill over in my planting needs into her fab yard/garden. Lilies of the Valley from TN's yard - my ultimate fave EVER! We’ve grown lettuce, red beets, carrots (the latter two for baby food = FREE and PESTICIDE-FREE! ), squash, pumpkins, tomatoes, peppers and all sorts of herbs. (I’ve tried tomatoes in a pot on my deck and they just don’t produce well.) We also have a perennial supply of raspberries, elderberries, rhubarb and we added blueberries this year. Pie and jam here we come! Where I don’t miss out, though, is adding some color and beauty to my deck. I’ve tried all sorts of plants and flowers in the years since Shaun and I have had our own place. I’ve tried exotic. I’ve tried fragrant. I’ve tried herbs. Mostly, I’ve been disappointed with the exotic, and some of the fragrant, stuff. This year, I’m sticking with what I know will grow and grow well. For the two pots outside my front door (which are a big deal to me since the outside of my front door is not very curb-appealing), I need something that can take the heat. The sun spends most of the day beating down on them, and then the light reflects from the siding and gives them a double-dose of rays. I asked the lady at my local Ace Hardware greenhouse: what will last even if it gets roasted all day long? PETUNIAS! Fortunately petunias come in all sorts of nice colors and I’ve had success with them in the past. I bought the red, white and blue (deep purple) mix of ‘wave’ petunias, which are nice because they will grow and drape over the edge of my pots. They cost $5.99 for a six-pack. Festive and Patriotic all summer long! What else will work in my pots without fail? GERANIUMS! They can take a lot of heat and bloom all summer long. That’s my kind of plant. Thrifty Nana found some at Menards for $5 for 9 plants. That’s a huge score! I planted one large pot with 3 red plants and one large pot with 3 pink plants. Then I added some LOBELIA (small, lacy bluish-purple flowers) and another drapey accent plant (not sure the name) for $2.49 each. Geranium City - I can't wait till they fill in! Shaun suggested we try growing jalapeno peppers since tomatoes don’t work: $1.99 was a great price for our MUCHO NACHO PEPPER. Mucho Nacho Pepper is already blooming!! I got a CALIBRACHOA MINIFAVOUS DOUBLE PINK plant – which should be a perfect pot size, bloom all summer long, and can take the sunshine (it's kinda like a mini petunia) – for $4.49. Pink double mini-petunias - for cute! 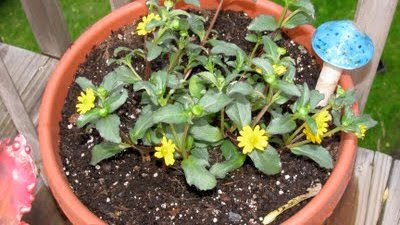 I got a SANVITALIA SUNBINI plant – which is a small bushy pot-size plant with yellow flowers. It also says it can take the sun, so I thought it was worth a shot for $5.49. ﻿The last of my deck plants was my most expensive. It’s some new breed of impatiens that are called SUNPATIENS. Impatiens are lovely flowering plants that can’t take the sun – they like shade or partial sun only. I’ve never planted them on my deck because of this. So when I saw this new breed that says it can take the heat, I wanted to splurge - $7.49. Let’s just say I’m going to be mega-ticked if this is a lame, wimpy plant that dies by July or doesn’t flower like regular impatiens do. If it works - FAB! ﻿﻿ Probably one of the most fun plant-pot combos is what I pick out for my upside-down pot. This goofy contraption is like a hanging pot that’s open at both ends. You plant the plant (they recommend coleus or begonia, but I haven’t had luck with begonia) in the bottom of the pot, with the bottom-end standing up. Then you allow the roots to set for 2 weeks, flip it over and hang it (we use a shepherd’s hook off of the deck). 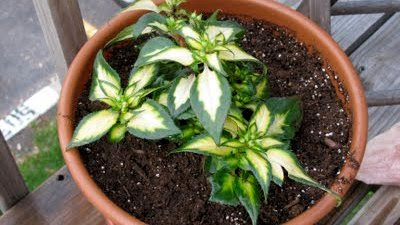 The plant grows upwards as plants are wont to do and eventually your coleus is growing up the sides of the upside-down pot. I bought my pot at the Minnesota Renaissance Festival, I think for $20. My COLEUS has dark burgundy leaves and I paid $3.99 for it. Last but not least, Shaun and I bought a ROSEMARY plant, which we put in a medium-small pot on our deck table – we cook with it in the summer and dry the rest for the winter. If you’ve never smelled rosemary, you’re missing out. It’s a divine herb. And it cost us a whopping $2.49. To round out the herbs Thrifty Nana gave us (FREE) a CHIVE plant from her garden, which is great for garnishing food all summer long. In total, we spent at Ace Hardware yesterday: $39.54. Plus I will have to pay Thrifty Nana for the geraniums (we'll do an even trade with some tomato plants) and get some plant food. I’ve spent hundreds of dollars in the past on my deck plants (the designer varieties add up – which is why I opted to limit myself this year), so I’m satisfied with my selections. The girls think it’s marvelous to help me water the plants, and I can’t tell you how much my deck plants brighten my days. I’ll do some more planting at Thrifty Nana’s in the next couple of weeks, but this will be more of the fruit and veg variety. There will be pumpkins 4 sho since those are my absolute fave to watch grow (and Shaun carves a mean Jack Skellington in the fall). Stay tuned, Friends!